Puppy can't hear or see well, stays close to mother and littermates. Breeder provides warm environment. 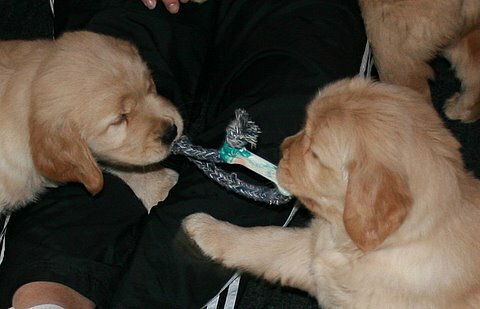 Dr. Michael Fox conducted a study showing mildly stressing puppies during the first five weeks develops dogs which are superior when put in learning or competitive situations. They are better able to handle stress, are more outgoing and learn more quickly. Mild physical stress at an early age will actually increase the size of the brain. Eyes open, puppy can hear, begins to walk in a wobbly fashion. They will begin to hear and will respond to taste and smell. This is the time to introduce novel stimuli to the whelping box such as a plastic milk bottle, knotted towel, cardboard box, etc. This is also a time to introduce puppies to friendly cats. It is important to continue picking up the pups daily, admire them, talk to them, and spend a few minutes with each one individually. Puppy is able to use senses of sight and hearing. It is a time of very rapid sensory development. A stable environment is crucial. It is important not to overload them. Radical changes in the environment must be avoided, i.e. do not move the whelping box! It is essential that the puppy remain with the litter and the mother. Each day introduce a new surface such as concrete, linoleum, wood, carpet, matting, etc. Taking them two at a time will make it less stressful than one at a time. Very mild auditory stimuli is introduced, such as a radio playing quietly. Puppy learns species specific behavior that makes him a dog (biting, chasing, barking, fighting and body posturing. Learns to accept discipline and to use submissive postures. Learns not to bite too hard. 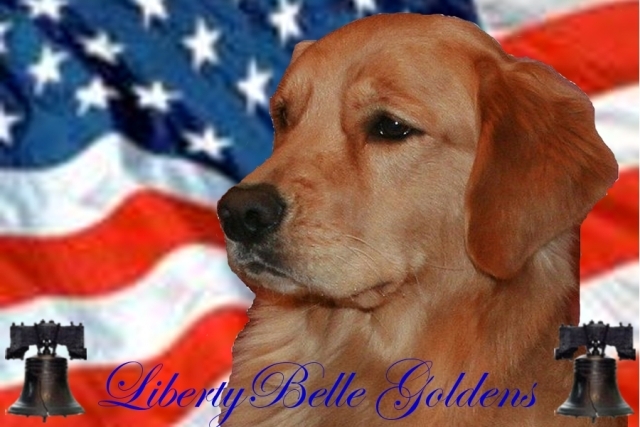 Learns to relate to other litter mates and develops a pack hierarchy through play. 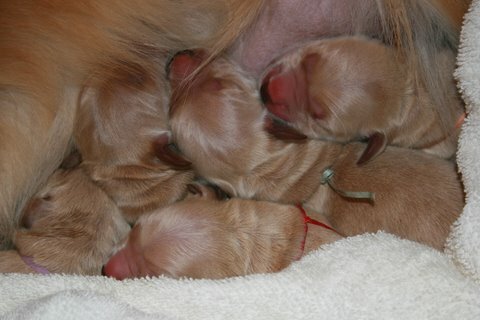 Mother begins to wean puppies between 4-8 weeks, but should be allowed as much time with the pups as she wants. 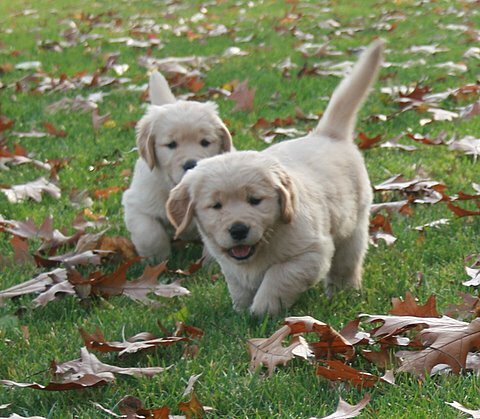 Puppies require plenty of playtime with littermates, so they can socialize. 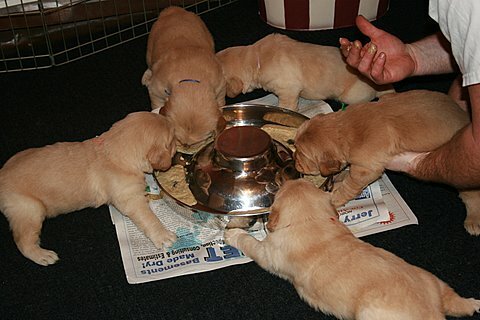 Leaving the litter before 7 weeks can affect the puppy's ability to get along with other dogs later and they will likely have trouble learning to inhibit the force of their bite. Put an open crate in the puppy pen. Clear distinction between sleep and play area should be made. This ensures the puppy can leave his sleeping area to eliminate. This will make housetraining later much easier. 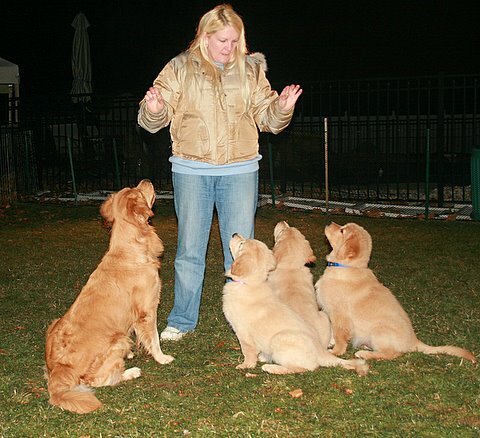 Each puppy should have one-on-one individual attention with humans. Take two at a time for short car rides. Occasionally isolate puppies to prepare them for separation. 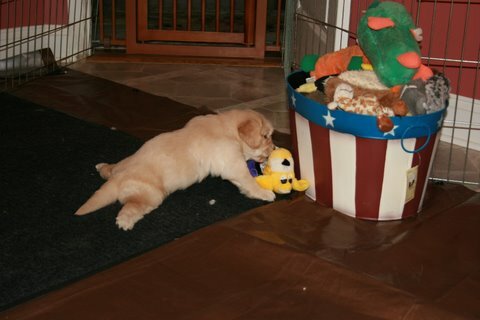 Puppy's rate of mental development will now depend on the complexity of their environment. Exposure to a variety of noises and different floor surfaces is important. Begin positive training sessions at 5 weeks. Into a new home with a human family. 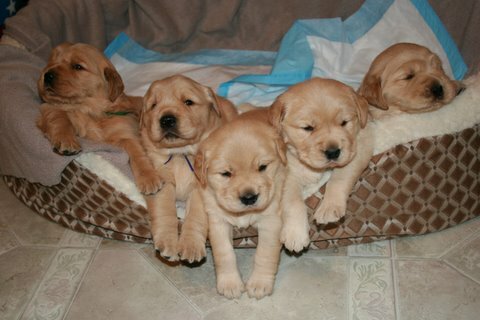 Best time to bring a puppy into its new home is around week 7or 8. "The 49th day" is recommended by Guide Dog raisers and supported by studies. Absolutely critical period in which puppy should be socialized - maximize this time! 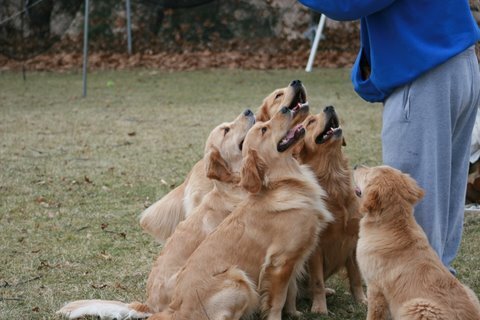 Enroll in a good puppy class! This period falls within the human imprint period. Anything that frightens the puppy during this period will have a more lasting effect than if it occurred at any other time. Keep training fun. Use short sessions, and keep all training positive. Gentle guidance and management are essential. Set your puppy up to succeed. This kind of mindset will enable you to be successful, as you continue to socialize your puppy. Puppies should not be shipped during this period, elective surgery should be put off until the 12th week, and necessary visits to the vet should be made fun. Learning to compete and cope. Puppy has been in the home for approximately six weeks. This period is known as the "period of cutting teeth and apron strings." Pups will attempt to clarify and resolve question of leadership. 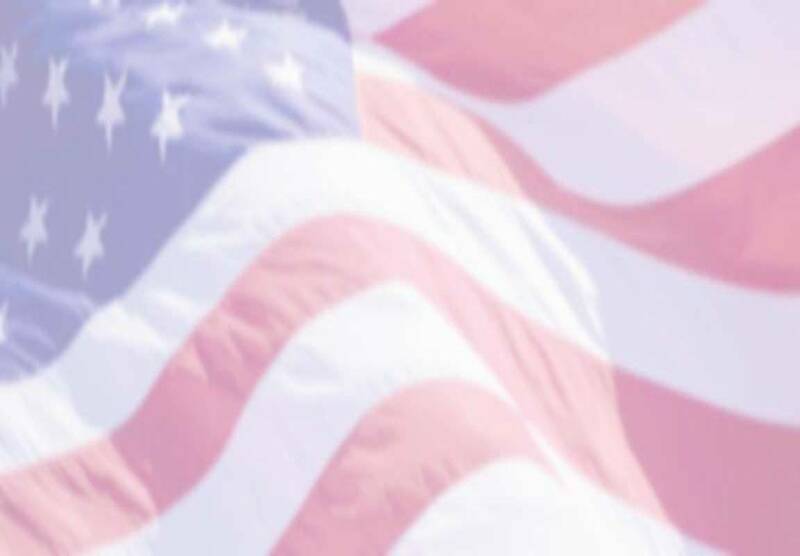 So long as you provide structure, control and leadership, this transition should be relatively painless. If these things have not been provided, all heck is about to break loose! "Seems to forget everything previously learned." - "How to Raise a Puppy You Can Live With"
Even if you have done your homework it does not mean your puppy won't go through this - just be aware of it and ride it out. Just keep your pup on a leash until this passes. This stage can last from a few days to several weeks and can occur anytime during this period. A puppy will test its wings. He may challenge you in an attempt to resolve the question of leadership. He may not come when called. He may not play fetch even though he once did. He will be uncomfortable because his adult teeth are growing in. It is because of this stage that prevention over cure is advocated -- you must start socializing and training before now! When you notice a change in your dog during this time, he is probably going through his "flight instinct" period. Like a teenager going through puberty, your puppy is changing physiologically. Your awareness of these changes in behavior will help get you through this commonly difficult period. This is the time when obedience schools get most of their calls. Puppies that have not been socialized and worked with take a different path in life than pups that have. Be prepared with appropriate chew bones (large enough so that the pup will not choke) to help with your pup's need to chew. Use a long line in the park if your pup is not coming when called. Many dogs will show a rise in their level of aggression (reactivity) during this time. They may become protective and territorial. Incidents of teenage flakiness may recur. In large breeds this period could extend longer since it is tied to sexual maturity. Incidents may occur more than once. Corresponds with growth spurts. Therefore it may happen more than once as the puppy matures. May suddenly be apprehensive about new things or shy or timid of new people or situations. Most of height growing is over, but pup will start to fill out over the coming year. 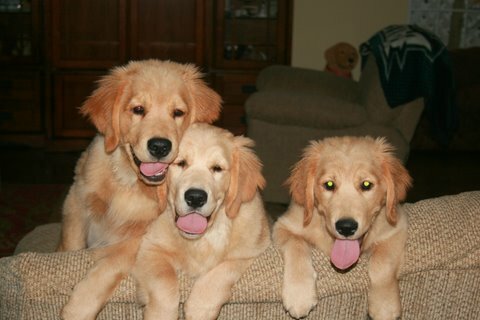 Puppy begins to mature sexually: male begins to lift leg, and female has first heat period anywhere from 6-12 months. Puppy coat being replaced by adult coat, starting down the spine. This is a fear of new situations and are handled with the utmost patience. The dog is encouraged to work it out on his own. If anything, it is better to ignore the whole situation than to reinforce the fear by praising the dog or petting him while he is afraid. When you "reassure" a dog with pets and "it's okay, fella", you are telling him it is okay to be frightened and you are creating a potential problem. If your puppy appears apprehensive, avoid confrontation. Avoid any potentially overwhelming circumstances you cannot personally oversee, such as shipping your pup in the cargo bay of an airplane. Are you done socializing? NO! Like your training efforts, which continue on into adulthood and throughout your dog’s entire life, you are never done with socialization. He still needs to meet and greet people, go places with you, and continue to share your world and your experiences, if you want him to continue to be the happy, friendly dog he is today. Refers to sexual maturity as opposed to being full-grown. Smaller dogs mature earlier, larger dogs later. If you were lax in your work earlier on, you may now see the things you have missed: object guarding, unfavorable reactions towards unfamiliar people, animals, or things that your dog missed during the socialization stage. Until this period has been reached, it is recommended that your pup remains crated or the equivilent (structure) when you are not available to supervise his behavior. You will know when your dog can be trusted by testing him for short periods (10-15 minutes) while you leave the house. If your dog is damaging property while loose, he is not ready.